So I’ve told you in the past that I LOVE cheese but did you know that my all time favorite, I would eat it all day everyday if only I wouldn’t gain a million pounds cheese is Brie? I’ve loved it since I was little. I remember the first time I had brie when I was little. We lived in Charlotte at the time so I was between first and third grade and my parents were entertaining work friends, or maybe they were entertaining us. The clearest part of that memory is asking what kind of cheese was on the table all melty, gooey and buttery. They told me it was brie and as soon as it was in my mouth I was in LOVE!!! I didn’t like the rind at first but now I love every bit of it. For this recipe I took the rind off to allow the cheese to mix with the sugar and bacon better as it melted but you better believe that I was snacking on all the pieces of rind like they were chips that afternoon!!! The inspiration for this dish came from a trip we had out to California to visit my Mom & Dad. We went to a restaurant to see one of their friends play base in a band, Max Bennet. It was so much fun and he has such a great story! He’s played with some truly great musicians and had a great career. If you’re in the Southern California area you should swing by to listen to him play sometime. Anyway….. we ordered a hummus plate that had these little bites of Heaven as a garnish. It tasted like brie with brown sugar wrapped in bacon. I tried to duplicate that at home and they didn’t look that great so these were born. I love crescent rolls don’t you? By themselves they are great but you can do so much with them too! These are pretty easy to make. When you lay your crescent dough out in the triangle you’ll just lay your ingredients on the large side base of the triangle and roll up, just like I did in the picture above. 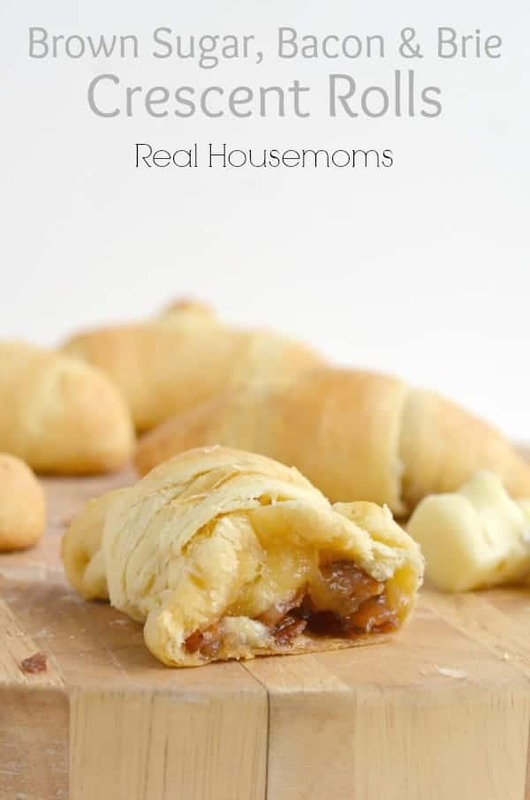 What do you make with crescent rolls? 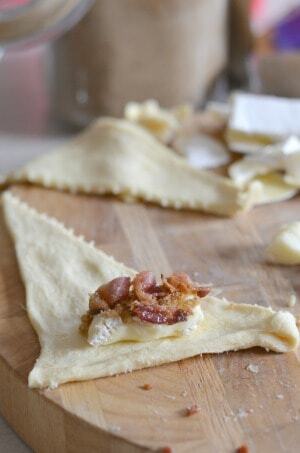 These crescent rolls are dressed up with brown sugar, bacon and brie to create a yummy treat for you to serve your friends and family! As soon as I saw brie was involved I knew this was an Aubrey recipe. You are going be surprised but I am actually going to try this recipe and make it with brie. It has bacon and brown sugar what’s not to love…lol This might actually be something with a stinky cheese that you get me to like Aubrey! I will let you know…. I can’t wait to hear how your brie experience goes! You could pretty much cover anything in brown sugar and bacon and it would be good but you cover brie in brown sugar and bacon and it’s incredible! i will to try making this recipe seem simple enough. love to make simple recipes.